The invention relates to filtration media for filtering particulate material from gas streams. A composite fabric formed by depositing a web of nanofibers electroblown from a first polymer onto a first support web comprising fibers of larger average diameter than the nanofibers spun from a compatible material, in the absence of an adhesive between the webs, and solvent-bonding the webs together. 本申请是申请号为200580048815. 6,申请日为2005年12月28日，发明名称为"用于从气体物流过滤颗粒材料的过滤介质"的中国专利申请的分案申请。  The present application is a continuation of Application No. 200580048815.6, filed December 28, 2005, is a divisional application entitled "filter media for filtering particulate material from a gas stream," the Chinese patent application. 本发明涉及适用作空气过滤介质的复合非织造织物，用于从流体物流中过滤颗粒材料。  The present invention relates to a composite nonwoven fabric useful as air filtration media, for filtering particulate material from a fluid stream. 在对0. 3微米颗粒过滤时执行效率小于99. 97%的HVAC空气过滤器中通常采用的过滤介质是基于玻璃、纤维素或聚合物的。 HVAC air filter media filtration  At the time of 0.3 micron particle filtration efficiency of less than 99.97% is usually based on glass, cellulose or polymer. 由该性能范围内介质制得的过滤器典型的被称作"ASHRAE 过滤器，'，因为American Society of Heating，Refrigerating and Air - Conditioning Engineer为在这些应用中的过滤介质的性能撰写标准。基于聚合物的过滤介质典型的为纺粘或熔喷非织造织物，与由湿法成网造纸方法制造的玻璃或纤维素介质相t匕，该非织造织物通常经过静电改善以在较低的压力下降提供更高的过滤效率。 Obtained by the filter medium within the performance range is typically referred to as "ASHRAE filters," because the American Society of Heating, Refrigerating and Air -. Conditioning Engineer the performance of the filter medium in these applications are based on written standards polymerization the filter media was typical spunbond or meltblown nonwoven fabric, glass or cellulose media manufactured by the wet laid papermaking process with t dagger, the nonwoven fabric is generally improved through a lower static pressure drop It provides higher filtration efficiency. 静电改善的空气过滤介质和湿法成网工艺制造的介质，更具体的玻璃纤维的使用，目前有局限。  The improved electrostatic air filtration media and media manufactured by the wet laid process, more particularly glass fibers, currently have limitations. 静电处理的熔喷过滤介质，如美国专利4, 874, 659和4, 178, 157中描述的，起初性能还好，可是在使用过程中很快损失过滤效率，这是由于当介质开始捕获颗粒时带来粉尘负荷并且静电电荷由此变得绝缘。 Electrostatic filter medium meltblown process, as described in U.S. Patent No. 4, 874, 659 and 4, 178, 157 described initially better performance, but in the course of rapid loss of filtration efficiency, which is due to start capturing particles when the medium bring dust load and the electrostatic charge thus becomes insulated. 另外，由于有效的颗粒捕获是基于电荷的，所以这种过滤器的性能被空气湿度严重影响，产生电荷损耗。 Further, since the effective charge is based on the capture of the particles, so the performance of such a filter is severely affected air humidity, charge loss generated. 使用微型玻璃纤维和含微型玻璃纤维的混合物的过滤介质典型包含以织造或非织造结构排列的小直径玻璃纤维，其具有显著的抗化学腐蚀作用和相对小的气孔尺寸。  The use of micro-glass fibers and the filter medium is typically a mixture containing the micro-glass fibers comprise glass fibers with a small diameter arranged in a woven or nonwoven structure, having a significant effect chemical resistance and relatively small pore size. 这种玻璃纤维介质在下列美国专利中被公开：Smith等，美国专利2, 797, 163 ;Waggoner， 美国专利3, 228, 825 ;Raczek，美国专利3, 240, 663 ;Young 等，美国专利3, 249, 491 ; Bodendorfet等，美国专利3, 253, 978 ;Adams，美国专利3, 375, 155 ;以及Pews等，美国专利3, 882, 135。 Such glass fiber media are disclosed in the following U.S. Patents: Smith et al., U.S. Patent No. 2, 797, 163; Waggoner, U.S. Patent No. 3, 228, 825; Raczek, U.S. Patent No. 3, 240, 663; Young et al., U.S. Patent No. 3 , 249, 491; Bodendorfet et al., U.S. Patent No. 3, 253, 978; Adams, U.S. Patent No. 3, 375, 155; and Pews et al., U.S. Patent No. 3, 882, 135. 微型玻璃纤维和含微型玻璃纤维的混合物典型的相对易碎，因此在将其打褶时，破碎造成不期望的产率损失。 The mixture containing micro-glass fibers and micro-glass fibers typically relatively brittle, so when it is in the pleated crushing cause undesirable yield losses. 破碎的微型玻璃纤维也可被含微型玻璃纤维的过滤器释放到空气中，如果该微型玻璃被吸入则产生潜在的健康危害。 Broken glass micro fibers may also be micro-filter containing glass fibers released into the air, if the micro-glass is drawn generated a potential health hazard. 提供一种装置以达到ASHRAE水平空气过滤，同时避免已知过滤介质的上述局限是将被期望的。  to provide a means to achieve a level of ASHRAE air filter, while avoiding the limitations of the above-described known filter media is to be expected. 在第一实施方案中，本发明涉及复合织物，其包含电喷聚合物纳米纤维网幅(web)，所述纳米纤维网幅经溶剂粘合到第一支撑网幅上，网幅之间没有粘合剂，所述第一支撑网幅包含平均直径比所述纳米纤维大并且由和所述纳米纤维相容的材料纺粘而成的纤维。  In the first embodiment, the present invention relates to a composite fabric comprising polymeric nanofibers EFI web (Web), the nanofiber web was solvent bonded to the first support web, web no adhesive between the first support web comprising nanofibers having an average diameter larger than that of spunbond and nano fiber and the fiber made of compatible materials. 另一个本发明的实施方案涉及形成复合织物的方法，包含电喷聚合物纳米纤维网幅和针对其的溶剂到移动的包含更大纤维的支撑网幅上，该更大纤维由与所述纳米纤维聚合物相容的材料纺粘而来；并对组合的网幅施加约4mm H2O〜170mm H2O的真空压力以溶剂粘合纳米网幅和支撑网幅。  Another embodiment of the method of the present invention relates to forming a composite fabric, comprising the polymer nanofibers EFI web and the support web containing larger fibers to movement thereof with respect to the solvent, the fiber by a greater the compatible polymer nanofibers from spunbond material; and applying a vacuum pressure of about 4mm combination H2O~170mm H2O solvent bonded web and a support web nano web. 1.复合织物，包含溶剂粘合到第一支撑网幅上的电喷聚合物纳米纤维网幅，所述第一支撑网幅包含比所述纳米纤维平均直径大并由与所述纳米纤维相容的材料纺丝形成的纤维，在所述网幅之间没有粘合剂。  1. The composite fabric containing the solvent bonded to the polymer nanofibers EFI web on a first supporting web, said web comprising a first support than the average diameter of the nanofibers by the large fibers spun nanofiber compatible material formed between the web without adhesive. 2.方面1的复合织物，其中纳米纤维聚合物选自聚酰胺、聚酯、聚氨酯、聚偏二氟乙烯和聚乙烯醇，所述支撑网幅包含选自聚酰胺、聚酯、聚氨酯、聚偏二氟乙烯、聚乙烯醇、 天然纤维和其组合的纤维。  2. The composite fabric of aspect 1, wherein the nanofiber polymer is selected from polyamides, polyesters, polyurethanes, polyvinylidene fluoride and polyvinyl alcohol, said support web comprising a selected polyamide, polyester, polyurethane, polyvinylidene fluoride, polyvinyl alcohol, natural fibers and combinations thereof. 3.方面1的复合织物，其中所述相容材料为聚合物的。  3. The composite fabric of aspect 1, wherein the compatible material is a polymer. 4.方面2的复合织物，其中纳米纤维和支撑网幅纤维均为聚酰胺。  4. The composite fabric of aspect 2, wherein the nanofiber web and the support are polyamide fibers. 5.方面3的复合织物，其中纳米纤维聚合物和所述支撑网幅的聚合物纤维是不同的聚合物。  The aspect of the composite fabric 3, wherein the nanofiber polymer and the polymer support web fibers are different polymers. 6.方面3的复合织物，其中所述支撑网幅包含不同聚合物纤维的组合。  6. The composite fabric of aspect 3, wherein the web support comprises a combination of fibers of different polymers. 7.方面6的复合织物，其中支撑网幅包含多层不同的聚合物纤维。  7. The composite fabric of aspect 6, wherein the support web comprises multiple layers of different polymeric fibers. 8.方面1的复合织物，其中支撑网幅为织造织物或非织造网幅。  8. The composite fabric of aspect 1, wherein the support web is a woven or nonwoven web. 9.方面8的复合织物，其中支撑网幅为非织造网幅，选自纺粘纤维、熔喷纤维、梳理纤维、湿法成网纤维和其组合。  9. The composite fabric aspect 8, wherein the support web is a nonwoven web selected from a spunbond fibers, meltblown fibers, carded, wet-laid fibers, and combinations thereof. 10.方面1的复合织物，其中纳米纤维网幅包含具有约200nm - 500nm平均纤维直径、至少约2. 5g/m2的单位重量的聚酰胺纳米纤维，且支撑网幅包含至少一层纺粘纤维。  10. The composite fabric of aspect 1, wherein the nanofiber web comprises a from about 200nm - 500nm average fiber diameter, basis weight polyamide nanofiber at least about 2. 5g / m2, and the web support comprises at least one layer spunbond fibers. 11.方面1的复合织物，其中纳米纤维网幅包含具有约200nm - 500nm平均纤维直径、至少2. 5g/m2的单位重量的聚酰胺纳米纤维，且支撑网幅包含梳理聚酰胺纤维和梳理聚酯纤维的双层结构，其中纳米纤维网幅与梳理聚酰胺纤维层溶剂粘合。  11. The composite fabric of aspect 1, wherein the nanofiber web comprises a from about 200nm - 500nm average fiber diameter, the basis weight of the polyamide nanofiber of at least 2. 5g / m2, and the web support comprises a polyamide carded fibers carded polyester fiber and two-layer structure, wherein the nanofiber web layer of polyamide fibers and carded solvent bonding. 12.方面1的复合织物，进一步包含第二支撑网幅，其包含比纳米纤维平均直径更大且由与所述纳米纤维相容的材料纺丝形成的纤维，所述第二支撑网幅溶剂粘合到所述纳米纤维网幅上，与第一支撑网幅相对。  12. The composite fabric aspect 1, further comprising a second support web, which comprises an average fiber diameter larger than the nano-fibers and are formed from compatible with the spun nanofiber material, said second support the solvent web adhered to the nanofiber web, opposite to the first support web. 13.方面12的复合织物，其中所述第一和第二支撑网幅在化学上相同。  13. The composite fabric of aspect 12, wherein said first and second support web are chemically identical. 14.方面2的复合织物，其中所述纳米纤维为聚酰胺且支撑网幅包含PET和天然纤维的混合物。  14. The composite fabric of aspect 2, wherein the support web and a polyamide mixture containing the nanofibers PET and natural fibers. 15.方面14的复合织物，其中所述天然纤维为纤维素。  15. The composite fabric of aspect 14, wherein said natural fibers are cellulose. 16.方面2的复合织物，其中所述纳米纤维为聚酰胺，支撑网幅纤维全是天然纤维。  16. The composite fabric of aspect 2, wherein the nano fiber is a polyamide, the support web fibers are all natural fibers. 17.方面16的复合织物，其中所述天然纤维为纤维素。  17. The composite fabric of aspect 16, wherein said natural fibers are cellulose. 18.方面2的复合织物，其中所述纳米纤维为聚乙烯醇，所述支撑网幅包含聚乙烯醇纤维和人造丝纤维的混合物。  18. The composite fabric of aspect 2, wherein the nano fiber is polyvinyl alcohol, the support web comprises a mixture of polyvinyl alcohol fibers and rayon fibers. 19.形成复合织物的方法，包含将聚合物纳米纤维网幅和针对其的溶剂电喷到移动的包含更大纤维的支撑网幅上，该更大纤维由与所述纳米纤维聚合物相容的材料纺丝形成；和，对所述结合的网幅施加约4mm H2O - 170mm H2O的真空压力以将所述纳米纤维网幅和所述支撑网幅溶剂粘合。 Method  19. The composite fabric is formed, the polymer comprising the nanofiber web and the support web to comprise a larger movement of the fibers for EFI solvent thereof, the larger the fibers by a polymeric nanofiber spun into a biocompatible material; and, about 4mm H2O is applied to the combined web - 170mm H2O of vacuum pressure to the nanofiber web and the support web solvent bonding. 20.方面19的方法，其中施加的真空压力在约60mm H2O - 170mm H2O,以形成溶剂粘合的纳米纤维网幅/支撑网幅复合织物。 Method  20. aspect 19, wherein the vacuum pressure applied at about 60mm H2O - 170mm H2O, solvent bonding to form a nanofiber web / support composite fabric web. 21.方面19的方法，其中施加的真空压力在约4mm H2O - 30mm H2O之间，且进一步包括沉积第二支撑网幅于所述纳米纤维网幅上以形成支撑网幅/纳米纤维网幅/支撑网幅式复合织物，该第二支撑网幅包含由与所述纳米纤维聚合物相容的材料纺丝形成的更大的纤维，并使所述复合织物经过凝固辊隙以使所述复合物溶剂粘合。 Method  21. aspect 19, wherein the applied vacuum pressure of about 4mm H2O - between 30mm H2O, and further comprising a second support web is deposited on the nanofiber web to form a support web / nanofiber web / fabric support composite web, the second web support comprises fibers formed from more compatible with the polymer material spun nano fiber, and the composite fabric through a nip to cause coagulation the composite solvent bonding. 22.方面21的方法，进一步包括在真空下干燥溶剂粘合的复合织物以去除溶剂。 Method  22. aspect 21, further comprising an adhesive composite fabric was dried under vacuum to remove the solvent to the solvent. 术语"纳米纤维"是指平均直径小于1000纳米的纤维。  The term "nanofibers" refers to fibers having an average diameter of less than 1000 nanometers. 术语"过滤介质"或"介质"是指带颗粒的流体通过的材料或材料的集合(collection)，伴随着至少暂时沉积颗粒材料在该介质内或上。  The term "filter medium" or "medium" refers to a material or collection of fluid with particles passing (collection), accompanied by at least temporarily depositing in the particulate material or medium. 术语"ASHRAE过滤器"是指任何适用于在取暖、通风和空调系统中从空气中过滤颗粒的过滤器。  The term "the ASHRAE filter" refers to any filter suitable for filtering particles from the air in the heating, ventilation and air conditioning systems. 术语"SN结构"是指包含支撑或"纱布（scrim) "⑶层和纳米纤维（N)层的多层非织造材料。  The term "the SN structure" refers to a multilayer nonwoven material "gauze (scrim)" ⑶ nanofiber layer (N) comprises a layer or a support. 术语"SNS结构"是指包含夹在两个支撑层之间的纳米纤维层的多层非织造材料。  The term "the SNS structure" refers to a multilayer nonwoven material comprising a support sandwiched between two layers of the nanofiber layer. 图1是形成适用于本发明的纳米纤维的现有技术电喷设备的阐述。  FIG. 1 is formed forth suitable nanofibers of the present invention the prior art EFI device. 图2是用于生产本发明的SNS溶剂粘合织物的工艺生产线的阐述。  FIG 2 is set forth for production of the inventive SNS solvent bonded fabric production line process. 本发明涉及适用作过滤介质的复合非织造织物，包含至少一层纳米纤维层和至少一层纱布层。  The present invention relates to a composite nonwoven fabric suitable for use as a filter medium, comprising at least one nanofiber layer and at least one layer of gauze. 该纳米纤维层包括基本上连续的有机聚合物纳米纤维的集合，该纳米纤维具有小于约1 μ m或IOOOnm的直径。 The nanofiber layer comprises a collection of substantially continuous organic polymeric nanofibers, the nanofibers having a diameter less than about 1 μ m or of IOOOnm. 这种过滤介质可用于过滤应用以去除流体物流中的颗粒材料，特别的，从气体物流如空气中去除颗粒材料。 Such filter media can be used in filtration applications for removing particulate material in a fluid stream, in particular, such as air to remove particulate material from a gas stream. 适用于空气过滤应用（包括ASHRAE过滤和交通工具舱室空气过滤）的过滤介质可这样制得：通过铺设一个或多个纳米纤维层与纱布层以形成SN x结构，或将一个或多个纳米纤维层置于两个纱布层之间以形成SNxS结构，其中X至少为1。  suitable for air filtration applications (including ASHRAE filtering and vehicle cabin air filter) of the filter medium may be prepared by: by laying down one or more nanofiber layers and the gauze layer to form SN x structure, or one or more a nanofiber layer interposed between two layers of gauze to form SNxS structure, wherein X is at least 1. 每个纳米纤维层具有至少约2. 5g/m2的单位重量，纳米纤维层的总单位重量为约25g/m2或更多。 Each nanofiber layer basis weight of at least about 2. 5g / m2, the total basis weight of the nanofiber layer is about 25g / m2 or more. 在本发明的介质中，纳米纤维层的厚度小于约ΙΟΟμπι ;有利的纳米纤维层的厚度大于5 μ m且小于100 μ m。  In the medium of the invention, the thickness of the nanofiber layer is less than about ΙΟΟμπι; advantageously greater than the thickness of the nanofiber layer is less than 5 μ m and 100 μ m. 纳米纤维层的厚度可根据纳米纤维聚合物的密度变化。 The thickness of the nanofiber layer can vary depending on the density of the nanofiber polymer. 如果纳米纤维层的固体体积分数增加，如通过压延或在高真空下收集纳米纤维层，可使得纳米纤维层的厚度降低而基本上不降低效率或其他过滤性质。 If the solid volume fraction of the nanofiber layer is increased, such as by calendering or collected nanofiber layer in a high vacuum, such that the thickness of the nanofiber layer can be reduced substantially without reducing the efficiency or other filtration properties. 在恒定层厚下增加固态含量，降低了孔尺寸且提高过滤效率。 Increasing the layer thickness at a constant solid content, reducing the pore size and increase the filtration efficiency. 本发明中的纳米纤维层可根据美国出版专利申请No. 2004/0116028A1中公开的阻挡网幅来制作，在此该专利被引作参考。  In the present invention, the nanofiber layer according to U.S. Patent Application Publication No. 2004 / 0116028A1 disclosed a barrier web to produce, which patent is incorporated herein by reference. 纳米纤维层由基本上连续的聚合物纤维制成，所述聚合物纤维具有小于IOOOnm 的直径，有利的在约IOOnm和约700nm之间，或者甚至在约200nm和约650nm之间，或者甚至在约200nm和约500nm之间，或者甚至在约300nm和400nm之间。  The nanofiber layer is made of a substantially continuous polymeric fibers, the polymeric fibers having a diameter of less than IOOOnm, advantageously between about IOOnm about of 700 nm, or even between about 200nm and about 650nm, or even between about 200nm and about 500nm, or even between about 300nm and 400nm. 纳米纤维层的连续聚合物纤维可由电喷方法形成，该方法在PCT专利公开WO 03/080905A (对应美国专利系列号10/477, 882,于2002年11月20提交）中公开，其在此处被引作参考。 Nanofiber layer of continuous polymeric fibers may be formed EFI method, the method described in PCT Patent Publication WO 03 / 080905A (corresponding to U.S. Patent Application Serial No. 10/477, 882, filed on November 20, 2002) is disclosed, which is herein at incorporated by reference. WO 03/080905A公开用于生产纳米纤维网幅的设备和方法，设备基本上如图1所阐述。 WO 03 / 080905A discloses an apparatus and method for producing a nanofiber web, the apparatus 1 substantially as set forth. 方法包括从储存罐100 将包括聚合物和溶剂的聚合物溶液物流进料到纺丝头102内的系列纺丝喷嘴104中，该纺丝头被施加高电压，聚合物溶液从该纺丝头排放。 The method includes from the storage tank 100 includes a polymer and a solvent solution of the polymer stream fed to the spinning nozzle 104 in the series of the spinning head 102, the high voltage is applied spinneret, the polymer solution from the spinneret emission. 同时，任选在空气加热器108中被加热的压缩空气从置于纺丝喷嘴104旁边或外围的空气喷嘴106放出。 At the same time, it is optionally heated in air heater 108 from the compressed air spinning nozzle 104 is placed next to the periphery of the air nozzle 106 or discharged. 通常向下引导空气作为喷吹气体物流，其包被和推进新排放的聚合物溶液并协助形成纤维网幅，该网幅在真空室114 上的接地的多孔收集带110上被收集，真空室114的真空从空气鼓风机112的入口处施加。 The air is directed generally downward as a blowing gas stream which promote the coating and the polymer solution and to facilitate formation of new emission fiber web is collected on a grounded porous collection belt 110 of the web 114 on the vacuum chamber, the vacuum chamber vacuum 114 is applied from the air inlet of the blower 112. 通过电喷方法沉积的纳米纤维层总是夹带有大量的过程溶剂。  deposited by electrospray nanofibers layer is always a large amount of entrained process solvent. 在形成复合织物方法先前的实施方案中，例如在于2004年12月28提交并在此其被引作参考的美国临时申请60/639771中，在多数情况下纳米纤维层首先被沉积，然后在真空室114的帮助下，大多数被夹带的过程溶剂被去除之后才收集纳米纤维层成卷。 In the previous embodiment of the method of forming the composite fabric, wherein e.g. filed December 28, 2004 and which is herein incorporated by reference U.S. provisional application 60/639771, the nanofiber layer in most cases, is first deposited, and then in vacuo help chamber 114, most of the entrained process solvent was removed after being collected nanofiber layer into a roll. 然后通过粘合剂粘结，将纳米纤维层和纱布层手工结合以形成复合SN或SNS织物。 Then by adhesive bonding, the nanofiber layer and the layer of gauze combined to form a composite hand SNS SN or fabric. 已发现直接沉积电喷纳米纤维和过程溶剂于纱布层上，特别是含有由与纳米纤维聚合物相容材料制得的更大纤维的纱布层，允许直接原位粘结纳米纤维层和纱布，不需要在网幅之间另加单独的粘合剂。  It has been found EFI directly deposited nanofibers and a solvent on the process of the gauze layer, in particular a gauze layer containing nanofiber obtained by the polymeric material more compatible fibers, allowing direct bonding nanofiber layer in situ and gauze, no additional separate adhesive between the web. 根据本发明，"相容"聚合物是能自由溶解于过程溶剂中的那些，或其中纱布聚合物至少部分溶解于过程溶剂或可用过程溶剂溶胀，或其中纳米纤维和纱布聚合物具有相关极性，该极性不会差异到导致在没有单独粘合剂的情况下聚合物彼此不粘合。  According to the present invention, "compatible" polymer is dissolved in a process solvent can freely those, wherein gauze or polymer is at least partially soluble in the process solvent or solvent swelling processes are available, and gauze, or wherein the nanofiber polymer has Related polarity, the polarity difference does not cause the polymer to adhere to each other without a separate adhesive. 本发明者相信本发明的"溶剂粘合"由于下文讨论的一系列溶剂/聚合物相互作用而发生。 The present inventors believe that "solvent bonding" of the present invention, since a series of the solvent / polymer interaction occurs discussed below. 适于电喷的聚合物/溶剂结合在WO 03/080905A中公开，包括聚酰胺/甲酸。  EFI suitable polymer / solvent incorporated in WO 03 / 080905A is disclosed, comprising a polyamide / formic acid. 含有分离的与电喷纤维相容的聚合物纤维层的纱布的使用将被最优化以获得良好的溶剂粘合。 Using gauze-containing polymer fiber layer is compatible with the EFI fiber separation will be optimized to obtain good adhesion of the solvent. 在一个实施方案中，"相容"聚合物是指不同的聚合物纤维由具有基本相似化学组成的聚合物制得，即由单体的相似组合制得。 In one embodiment, "compatible" refers to a polymer different from polymer fibers having substantially similar chemical composition of the obtained polymer, i.e., to obtain a similar combination made by the monomers. 例如，在具有针对两者任一的合适电喷溶剂下，尼龙一6纤维与尼龙一6, 6纤维可成功的溶剂粘合。 For example, in a solvent, for a suitable EFI any one of both, a nylon 6 fiber and a nylon 6, 6 fiber can successfully solvent bonding. 化学相似的纤维聚合物不必要具有相同的分子量分布，所述单体的量不必要相同，所有单体也不必要完全一致。 Fibers chemically similar polymer having the same molecular weight distribution necessary, the same amount of the monomer necessary, all exactly the same monomers and unnecessary. 化学相似的聚合物在过程溶剂中的相对溶解度决定溶剂粘合的功效。 Similar chemical relative solubility of the polymer in a solvent in the process of determining the efficacy of solvent bonding. 根据本发明的溶剂粘合技术，纳米纤维聚合物可与纱布纤维聚合物化学不同，只要纱布纤维聚合物与纳米纤维聚合物相容即可，比如其中纱布纤维聚合物至少部分溶解于电喷溶剂中或可用电喷溶剂溶胀。  The solvent bonding techniques of the present invention, the nanofiber polymer may be chemically different polymer fiber gauze, gauze long fibrous polymer nanofiber polymers are compatible, such as gauze, wherein at least partially soluble in the fiber polymer EFI EFI available solvent or solvent swell. 如上所述，当纳米纤维和纱布纤维都由同种聚合物或能溶于同种溶剂的聚合物制得时，可在两层之间形成溶剂焊接粘结，此时聚合物纤维的相邻部分共同溶解（Co - dissolve)于电喷溶剂中，该溶剂随后被去除。 As described above, when the nanofibers and the fibers by the same gauze polymers or polymers soluble in the same solvent system to give, solvent welding bond may be formed between the two layers, when adjacent polymer fibers partially dissolved together (co - dissolve) in EFI solvent, the solvent is subsequently removed. 同样的，即便纱布聚合物不能自由溶解于过程溶剂中，只要其能被所述溶剂溶胀，就能获得合适的溶剂粘合。 Similarly, even if the gauze is not freely soluble polymer in a solvent process, as long as it can swell the solvent, a suitable solvent bonding can be obtained. 可替代的，即便当纱布纤维材料在电喷溶剂中不溶解或不溶胀，但是，由于在溶剂去除之前粘合在纱布纤维上的溶剂溶胀的纳米纤维的粘着性，可获得足够的"溶剂粘合"，只要这两种聚合物具有相容的相关极性，即在极性上不是过于差异。 Alternatively, even when the gauze fibrous material does not dissolve or swell in the solvent EFI, however, since the solvent is removed before bonding the fibers on the gauze solvent swollen nanofibers adhesion, sufficient "viscosity solvent together ", as long as the two polymers has an associated polarity compatible, i.e., not too different in polarity. 相应的，在这些情况下，纱布纤维可为聚合物；聚合物纤维和天然纤维的足额和， 例如纤维素、人造丝、棉等；甚至所有天然纤维，只要粘性的、纺粘后未经任何加工的纳米纤维可成功地粘合在至少部分纱布纤维上即可。  Accordingly, in these cases, the gauze may be a polymer fiber; polymeric fibers and natural fibers and full, such as cellulose, rayon, cotton and the like; natural fibers or even all, as long as the viscosity, spunbond after processing without any nanofiber can be successfully bonded to the fibers at least partially gauze. 例如，根据本发明，在甲酸中电喷的聚酰胺纳米纤维可成功地溶剂粘合到聚酯纤维纱布上，即使在甲酸中聚酯仅是边沿溶解的（如果有溶解的话）。  For example, according to the present invention, the polyamide in formic acid nanofiber EFI solvent can be successfully bonded to the polyester fiber gauze, even if only in formic acid polyester solubilized edge (if it was dissolved). 然而，在甲酸中电喷的聚酰胺纳米纤维不能充分粘合或粘结在聚丙烯纱布的纤维上，后者是高非极性的（见下文对比实施例B)。 However, in formic acid EFI polyamide nanofiber can not be sufficiently bonded or adhered to the polypropylene fiber of the gauze, which is highly non-polar (see below Comparative Example B). 因此由相对极性的聚合物形成的纳米纤维与高非极性聚合物纱布纤维，如聚烯烃，在本发明的意义中，是不"相容"的。 Thus nanofibers formed from relatively polar polymer nonpolar polymer and the high gauze fibers, such as polyolefins, in the sense of the present invention, is not "compatible" is. 已发现电喷聚合物纳米纤维可成功地"溶剂粘合"到含有至少部分纤维是由天然材料如纤维素纤维、人造丝纤维、棉纤维等制得的纱布上。 It has been found EFI polymer nanofibers can successfully "solvent bonding" to at least partially comprising fibers of natural materials such as cellulose fibers, rayon fibers, cotton fibers and the like made of gauze. 这种天然纤维材料在本发明的意义中是"相容的"。 Such natural fiber material is "compatible" in the sense of the present invention. 合适的相容的聚合物/溶剂组合的实例包括但不局限于聚酰胺如尼龙一6、尼龙一6, 6、尼龙一6, 10于甲酸中，间一聚芳族酰胺于DMAc (二甲基乙酰胺）中和对一聚芳族酰胺于硫酸中，聚酯如PET(聚对苯二甲酸乙二醇酯）、PBT(聚对苯二甲酸丁二醇酯）和PPT (聚对苯二甲酸丙二醇酯）于三氟乙酸/二氯甲烷或N -甲基一2 -吡咯烷酮(NMP)中，PAN(聚丙烯腈）于DMF(二甲基甲酰胺）或DMAc中，PVA(聚乙烯醇）于水中， 聚氨酯于DMAc中，和PVdF于DMAc或DMF中。  Examples of polymer / solvent combinations suitable include but are not limited to, compatibility with polyamides such as nylon-6, nylon-6, 6, nylon-6, 10 in formic acid, m-aramid in a DMAc (dimethylacetamide) and of an aramid in sulfuric acid, polyesters such as PET (polyethylene terephthalate), PBT (polybutylene terephthalate pair) and the PPT ( polyethylene terephthalate) in trifluoroacetic acid / dichloromethane or N - methyl-2 - pyrrolidone (NMP), PAN (polyacrylonitrile) in DMF (dimethyl formamide) or of DMAc, PVA (polyvinyl alcohol) in water, in the polyurethane of DMAc, and PVdF in DMAc or DMF. 某些聚酰胺存在其他合适的溶剂选择，如HFIP (1，1，1，3, 3, 3 -六氟异丙醇），其也溶解PET。 Other suitable solvents exist select certain polyamides, such as HFIP (1,1,1,3, 3, 3 - hexafluoroisopropanol), which is also dissolved PET. 聚合物溶解领域的技术人员将理解根据参考文献（如Allan FM Barton 的CRC Handbook of Solubility Parameters and Other Cohesion Parameters)通过匹配溶解度参数，一系列合适的聚合物/溶剂电喷体系可以匹配纱布材料。 The polymer was dissolved in the art will appreciate that the art according to reference (e.g., Allan FM Barton in CRC Handbook of Solubility Parameters and Other Cohesion Parameters) by matching the solubility parameter, a series of suitable polymer / solvent system may be matched EFI gauze material. 可能具有相对粗糙表面的纱布层比具有平滑表面的纱布层（如平滑粘结纱布）将提供与纳米纤维层更好的粘结。  may have a relatively rough surface than the layer of gauze gauze layer having a smooth surface (e.g., smooth adhesive gauze) nanofiber layer will provide better adhesion. 因此，根据本发明，复合织物由溶剂粘合纳米纤维层到纱布上形成SN结构（图1) 而制得，所述溶剂粘合是通过直接电喷纳米纤维层和夹带的过程溶剂到基本上连续的、由移动的收集带110支撑的纱布层上来进行。  Accordingly, a SN (Figure 1) in accordance with the present invention, the adhesive composite web into a solvent nanofiber layer prepared on the gauze, by a solvent bonding process is a direct electrospray nanofiber layer and entrained solvent to a substantially continuous layer of gauze supported by a moving collection belt 110 to thereby perform. 当溶剂粘合SN结构时，已经发现当在真空室收集器114上以大于约60mm H2O真空水平，如以约60mm H2O直至约170mm H2O,且有利的在约60mm H2O -约100mm H2O的真空水平，沉积纳米纤维/溶剂组合于支撑层上时，产生特别强劲的粘结。  When solvent bonding SN structure, it has been found when the collector on the vacuum chamber 114 of greater than about 60mm H2O vacuum level, such as about 60mm H2O up to about 170mm H2O, and advantageously from about 60mm H2O - about 100mm H2O level of vacuum deposition nanofiber / solvent combination at the time on the support layer, a particularly strong bond. 本发明的复合织物可通过在一次工序（single pass)中于纱布上形成纳米纤维层而制得，或使用多工序累积纳米纤维层至期望的厚度或单位重量，如在电喷方法中，来制得。  The composite fabric of the invention may be formed in one step by (single pass) at the nanofiber layer gauze prepared, using a multi-step accumulation or nanofiber layer to a desired thickness or basis weight, as in the method of EFI in be prepared. 电喷方法使得单位重量适用于空气过滤介质的纳米纤维层可以在一次工序中形成，这是因为比现有纳米纤维生产中已知的更高得聚合物溶液处理量是可能的。 Such that EFI method applied to an air unit weight may be formed in one step nanofiber layer filter medium, which is known from the prior because the nanofiber production was higher processing amount obtained polymer are possible. 取决于聚合物溶液流速和收集带速度，可在一次工序中形成具有约2. 5g/m2至甚至最高达25g/m2的单位重量的单层纳米纤维层。 Depending on the polymer solution flow rate and the collection belt speed, single nanofiber layer in one of about 2. 5g / m2 or even up to 25g / m2 basis weight in the forming step. 这种新方法在效率上的优势对于技术人员是显而易见的。 This new method advantage in efficiency for technicians is obvious. 通过根据本发明在一次工序中形成纳米纤维层，需要较少的操作，从而减少在最终过滤介质中引入缺陷的可能性，且使得纳米纤维层可以直接溶液粘结到纱布层上而不间断工艺流水线。 The operation of the present invention, by forming a nanofiber layer in step, less, thereby reducing the possibility of introducing defects in the final filter media and nanofiber layer such that the solution can be directly adhered to the gauze layer continuous process assembly line. 当然，本领域技术人员将理解在某些情况下，使用多个电喷束来接连沉积多个至少约2. 5g/m2 的纳米纤维层会有利，以累积总纳米纤维层单位重量至如约25g/m2或更多。 Of course, those skilled in the art will appreciate that in some cases, a plurality of EFI beams successively depositing a plurality of at least about 2. 5g / m2 nanofiber layer can be advantageous to accumulate the total nanofiber layer basis weight of about 25g to as / m2 or more. 为了改善纳米纤维平铺速率和由此的单层纳米纤维层的单位重量，纺丝条件的改变可在收集带速度、聚合物溶液流速中实现，甚至可以通过改变聚合物在溶液中的浓度来实现。 In order to improve the basis weight of the nanofiber change and thus the rate of single layer tiles nanofiber layer, the spinning conditions may be collection belt speed, polymer solution flow rate to achieve, even by varying the concentration of the polymer in the solution achieve. 在本发明的另一个实施方案中，SNS复合织物可在连续的操作中形成和粘结。 , SNS composite fabric and the adhesive may be formed in a continuous operation in another embodiment of the present invention. 在该实施方案中（图2)，基本连续的支撑或纱布层122由供给辊121提供到移动的收集带110 上，并被导入纺丝室120中，在一个或多个电喷束102下，以在适当的真空下沉积一层或多层含有溶剂的纳米纤维于移动的纱布上，从而形成SN结构123。 In this embodiment (FIG. 2), or substantially continuous support gauze layer 122 provided by the supply roller 121 to move the collector belt 110, and is introduced into the spinning chamber 120, at one or more beams 102 EFI nanofibers to deposit one or more layers at a suitable vacuum in the moving solvent containing gauze, thereby forming a structure 123 SN. 真空室114的真空水平由真空吹风机112维持在约4mm H2O直至约30mm H2O,这样以协助纳米纤维层的收集，但不能太高以至于去除大量的过程溶剂。 Vacuum level of the vacuum chamber 114 is maintained by the vacuum blower at about 112 up to about 4mm H2O 30mm H2O, so to help collect the nanofiber layer, but not so high as to remove the bulk of the solvent process. 随后，第二纱布125,其可以与支撑纱布122相同或不同，由顶部纱布供给棍124提供并被引导通过第一张紧棍118,绕过凝固棍（consolidation roll) 126,然后在凝固辊的轻压下沉积在纳米纤维层（一层或多层）上面，以形成多层SNS 复合织物127。 Subsequently, a second gauze 125, which may be the same or different support gauze 122, 124 is supplied from the top of the stick gauze provided and is directed through a first tensioning bar 118, bypassing solidified stick (consolidation roll) 126, and then solidifying the roll Soft Reduction nanofiber layer deposited on the (one or more) above, to form a multilayer composite fabric SNS 127. 轻压作用是确保相邻织物层之间的完全接触以允许存留在纳米纤维层中的溶剂将不同层的纤维软化和焊接在一起。 Effect of light pressure to ensure full contact between the adjacent layers to allow the fabric remain in the nanofiber layer of the fibers to soften and solvent welding together of the different layers. 优选维持压力以确保层与层之间足够的接触和粘结，但不能太高以致于使各个纤维变形或显著降低织物的整体渗透率。 Preferably maintaining sufficient pressure to ensure contact between the adhesive layers, but not so high as to cause the individual fibers deform or significantly reducing the overall permeability of the fabric. 接着，溶剂粘合的SNS复合织物127被引导通过另一个张紧辊118,而后通过第二真空室115,该真空室以更高的真空水平工作以去除剩余溶剂，然后复合织物卷绕在收卷辊130上。 Next, an SNS solvent bonding composite fabric 127 is guided through the other tension roller 118, and then through the second vacuum chamber 115, the vacuum chamber at a higher vacuum level work to remove the remaining solvent and then closing wound composite fabric roll on roller 130. 本领域的技术人员将理解，真空室114和真空室115的最优真空水平很大程度上取决于电喷和粘合工艺中使用的聚合物/溶剂组合。  Those skilled in the art will appreciate that the optimum vacuum level in the vacuum chamber 115 and vacuum chamber 114 largely depends on the polymer / solvent combination and EFI adhesive used in the process. 例如，在二个阶段其中之一或二者中， 较易挥发的溶剂可能需要较低的真空以获得此文说明的溶剂粘合和去除功能。 E.g., wherein one or both of two stages, relatively volatile solvents may require lower vacuo to obtain a pressure-sensitive adhesive and a solvent removal function described in this article. 有利的，纱布层是纺粘（SB)非织造层，但纱布层可以是梳理、湿法成网、熔喷或其他方法形成和凝固的非织造聚合物和/或天然纤维、和织造聚合物和/或天然纤维织物等的网幅。  Advantageously, the gauze layer is a spunbond (SB) nonwoven layers, but the gauze layer may be carded, wet-laid, meltblown, or other method for forming a nonwoven polymer coagulated and / or natural fibers, and woven polymeric and / or natural fibers like web. 纱布层需要足够的刚度以维持褶裥和死褶。 Gauze layer requires sufficient rigidity to maintain pleats and dead fold. 单个纱布层的刚度有利的至少在l〇g， 如下面所述由织物手感测试仪所测量的。 Stiffness of the individual layers of gauze advantageously at least l〇g, as described below by a fabric feel measured by the tester. 特高的刚度可通过用丙烯酸粘结梳理的或者湿法成网的、包含粗短纤维的纱布来获得。 Laid high stiffness can be obtained by using an acrylic adhesive carded or wetlaid, stubby gauze comprising fibers obtained. 纱布层可以是多层织物，如梳理聚（对苯二甲酸乙二醇酯）（PET)纤维和梳理尼龙纤维层的叠层物，或其他这种多层织物。 Gauze layer may be a multilayer fabric, such as a comb poly (ethylene terephthalate) (PET) fiber and nylon fiber layer is carded laminate, or other such multilayer fabric. 有利的，本发明的过滤介质具有至少45g的整体织物手感刚度和SNxS结构，其中至少两层纱布层贡献了刚度， 纳米纤维层层数X至少是1。 Advantageously, the filter medium of the present invention having an integral structure SNxS textile hand and stiffness of at least 45g, wherein the at least two layers of gauze stiffness contributed nanofiber layer number X is at least 1. 在SNS结构情况下，两层纱布层可相同，或可在单位重量、纤维组成或形成技术上不同。 In the case of SNS structure, two layers of gauze layers may be the same or different composition or be formed technically basis weight, fiber. 例如，支撑纱布可为纺粘聚酰胺非织造网幅，在其上沉积聚酰胺纳米纤维层，上层纱布可为由第三种聚合物制得的织造的、梳理的或纺粘的层，只要第三种聚合物与纳米纤维聚合物相容。 For example, the support may be a gauze spunbonded polyamide nonwoven web, in which the polyamide nanofiber layer is deposited on the upper layer may be a woven gauze made of the third polymer, carded or spunbond layer, as long as third polymer compatible with the polymer nanofibers. 另一种有利的层组合是电喷聚酰胺纳米纤维层与由PET纤维、纤维素纤维或甚至PET和纤维素纤维的混合物制得的湿法成网非织造纱布溶剂粘合。 Another advantageous combination is the EFI layer and the polyamide nanofiber layer of PET fibers, cellulose fibers or a mixture of cellulosic fibers and PET even in the wet-laid nonwoven gauze was solvent bonding. 另一种有利的层组合是电喷聚乙烯醇纤维与PVA和人造丝纤维的复合湿法成网层粘结。 Another advantageous combination is a layer of polyvinyl alcohol fibers and EFI wetlaid composite layer rayon fibers and PVA binder. 本发明的复合织物可被构造成任何期望的过滤器形式，例如筒、平盘、罐、板、包和袋。  The composite fabric of the present invention may be configured to filter any desired form such as cylindrical, flat plate, tanks, panels, bags and sacks. 在上述结构的内部，该介质基本上可被打褶、卷曲或置于支撑结构上。 Inside the structure, which media can be substantially pleated, crimped or placed on a support structure. 本发明的过滤介质实质上可用于任何传统的结构，包括平板过滤器、椭圆形过滤器、筒状过滤器、螺旋盘绕状过滤器结构，且可用于褶状的Z型过滤器、V - bank或其他包括该介质形成有用形状或轮廓的几何构造。 The filter media of the present invention may be used for virtually any conventional structure including flat panel filters, oval filters, cartridge-like filter, a spiral wound filter structures like, and may be used for Z-pleated filter, V - bank or other media to form useful include the shape or profile geometry. 有利的几何形态包括褶状的圆柱模式。 Advantageously geometry comprises a cylindrical pleated pattern. 过滤介质的最初压降（本文中还称为"压降"或"压力差"）有利地低于约30mmH20， 更有利的低于约24mmH 20。  the initial drop of the filter medium (also referred to herein as "drop" or "pressure difference") is advantageously below about 30mmH20, more advantageously less than about 24mmH 20. 在使用期间，由于颗粒堵塞过滤器，所以过滤器的压降随时间增力口。 During use, due to particle clogging of the filter, the pressure drop across the filter over time booster port. 假设其他变量保持恒定，过滤器的压降越高，过滤器的寿命越短。 Assuming all other variables remain constant higher, the pressure drop of the filter, the shorter the life of the filter. 当达到过滤器的选定极限压降时，过滤器典型地被确定为需要替换。 When the filter reaches a selected limit pressure drop, the filter typically is determined to need replacement. 极限压降随应用而变化。 Limit the pressure drop varies with the application. 由于这种压力的积累是粉尘（或颗粒）负荷的结果，对于同等效率系统，较长寿命典型地直接与较高的负荷能力相关。 Due to the accumulation result of this pressure load of dust (or particles), for the same efficiency of the system, typically a long life is directly related to the higher load capacity. 效率是介质捕捉颗粒而非使颗粒通过的趋势。 Efficiency is the media to capture particles rather than by the tendency of the particles. 假设其他变量保持恒定，通常过滤介质从流体流动物流去除颗粒的效率越大，过滤介质将越迅速地达到"寿命"压力差。 Assuming all other variables remain constant, typically greater removal efficiency of particulate filter medium, the filter medium will quickly reach the "lifetime" pressure differential from the fluid flow stream. 已发现本发明的溶剂粘合的复合织物提供不寻常的流体渗透率和效率的组合，与传统的用于空气过滤应用的湿法成网微型玻璃介质和美国临时申请60/639771中的粘合剂粘结的复合物二者相比。  It has been found according to the present invention, solvent bonded composite fabric provides the unusual combination of fluid permeability and efficiency, wet-laid glass media with traditional miniature for air filtration applications and in U.S. Provisional Application 60/639771 both compared to the adhesive bond composite. 本发明的过滤介质具有至少约20%的效率，意指该介质能在以面速度5. 33cm/秒流动的空气中过滤掉至少约20%的具0.3μπι直径的颗粒。  The filter media of the present invention has at least about 20% efficient, meaning that the medium is capable of filtering out at least about 20% of the particles having a diameter 0.3μπι air face velocity 5. 33cm / sec flowing. 为了用于ASHRAE过滤器，有利的，本发明的介质能在以面速度5. 33cm/秒流动的空气中过滤掉至少约30 %至最高约99. 97%的(λ 3μπι 的颗粒。 For use in ASHRAE filters, advantageously, the medium of the present invention is capable of filtering out at least about 30% up to about 99.97% of ([lambda] 3μπι particles in the air face velocity 5. 33cm / sec flowing. 假设其他变量保持恒定，过滤介质的空气渗透率越高，压降越低，从而过滤器寿命越长。  assuming all other variables remain constant, the higher the air permeability of the filter medium, the lower the pressure drop, so that the longer the filter life. 有利的，本发明的过滤介质的Frazier (弗雪泽）空气渗透率至少为约0.91m3/min/ m2,典型的直到约48m3/min/m2。 Advantageously, Frazier filter medium of the present invention (Eph snow Ze) an air permeability of at least about 0.91m3 / min / m2, typically up to about 48m3 / min / m2. 本发明的过滤介质有利的是基本上电中性，因此受到空气湿度的影响小很多，与上述美国专利4, 874, 659和4, 178, 157所公开的性能归功于与其相关的电荷的过滤器相比较而言。  Advantageously the filter medium of the present invention is substantially electrically neutral and therefore affected by the air humidity is much smaller, and associated with the aforementioned U.S. Patent No. 4, 874, 659 and 4, 178, 157 due to the performance of the disclosed charged filter comparison. "基本上电中性"是指该介质不带可被检测到的电荷。 "Substantially neutral" is meant that the uncharged medium to be detected. 过滤效率由从TSI Incorporated (St. Paul，Minnesota)商业化可得的Fractional Efficiency Filter Tester Model 3160决定。  Filter Tester Model 3160 filtration efficiency is determined by the Fractional Efficiency from TSI Incorporated (St. Paul, Minnesota) commercially available. 输入目标气溶胶颗粒的期望粒径到测试器的软件中，且设定期望的过滤器流速。 Enter the desired target particle size of aerosol particles to the tester of the software, and setting a desired flow rate of the filter. 使用32. 4升/分钟的体积计量的气流速率和5. 33cm/ 秒的面速度。 Gas flow rate used 32.4 liters / min and a face velocity metered volume 5. 33cm / sec. 测试自动连续进行直到过滤器进行了每种所选粒径的过滤。 Testing continued until the automatic filters filtering each selected particle size. 然后打印含有每种粒径的过滤器效率数据和压降的报告。 Then print the report containing filter efficiency data for each particle diameter and pressure drop. 在下列数据中报告的效率仅指0. 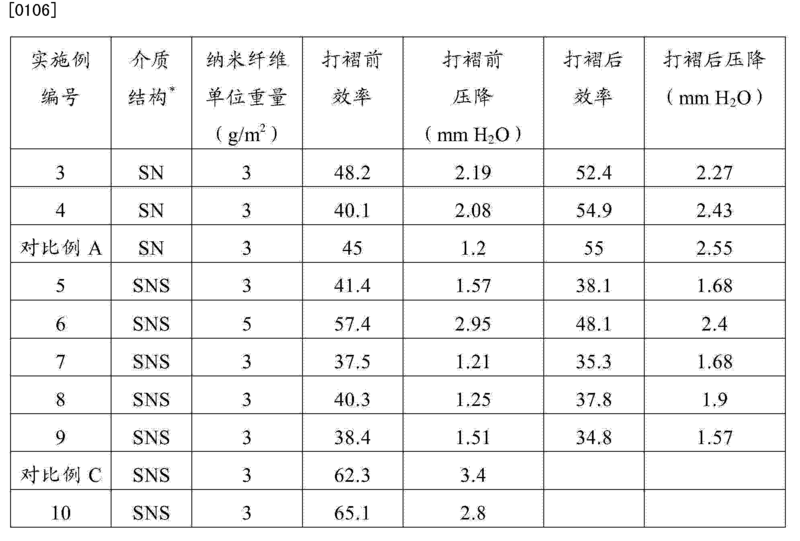 3微米颗粒任务。 Efficiency data reported in the following refers only to 0.3 micron particles task. 压降由从TSI Incorporated (St. Paul，Minnesota)商业化可得的Fractional Efficiency Filter Tester Model 3160给出报告。  The pressure drop is given by the report Filter Tester Model 3160 from TSI Incorporated (St. Paul, Minnesota) commercially available Fractional Efficiency. 测试条件在过滤效率测试方法中进行了描述。 The test conditions described in filtration efficiency test method. 压降以毫米水柱报告，在本文中还称为mm H20。 Report mm water column pressure drop, also referred to herein mm H20. 单位重量由ASTM D - 3776确定，其在此被引作参考且以g/m2报告。  The basis weight of ASTM D - 3776 is determined, which is hereby incorporated by reference and in g / m2 report. 碰由ASTM D177 - 64确定，其在此被引作参考且以微米报告。  touch the ASTM D177 - 64 is determined, which is incorporated by reference herein, and reported in microns. 纤维肓径按下列方式决定。  The fiber diameter of the blind determined in the following manner. 每个纳米纤维层样品取十个扫描电子显微镜(SEM) 5000倍放大的图像。 Each nanofiber layer sample taken ten magnified 5000 times the scanning electron microscopy image (SEM). 测量和记录这些照片中11个清晰可辨的纳米纤维的直径。 Measure and record the diameter 11 of these photographs clearly distinguishable nanofibers. 不包括缺陷（即，纳米纤维的堆积、聚合物滴、纳米纤维的交叉）。 It does not include a defect (i.e., deposited nanofibers, polymer drops, cross nanofibers). 计算每个样品的平均纤维直径。 Calculating an average fiber diameter for each sample. 刚度用Thwing Albert Instrument Co.(费城，宾西法尼亚）生产的"织物手感测试仪"仪器测定。  Stiffness was measured by Thwing Albert Instrument Co. (Philadelphia, Pennsylvania) production of "textile hand Tester" apparatus. 织物手感测试仪以克来测量当强迫材料标本进入边缘平行的槽时刮刀遇到的阻力。 Fabric feel tester is measured in grams when forced into the material specimen parallel edges resistance encountered by the blade grooves. 此为材料刚度的指示，其与材料的柔性成相反关系。 This is an indication of the stiffness of the material, its flexibility is inversely related to the material. 刚度在材料的纵向（机器方向）和横向（横切机器方向）都被测量。 Stiffness in the longitudinal direction of the material (the machine direction) and transverse (cross-machine direction) were measured. Frazier (弗雪泽）渗诱率是多孔材料的空气渗诱率的度量,以ft3/min/ft2单位报告。  Frazier (Eph snow Ze) is a measure of air permeability induced induced infiltration of a porous material, in ft3 / min / ft2 unit report. 它测量在0.5英寸（12. 7_)水柱的压力差下空气流通过材料的体积。 It measured 0.5 inches (12 7_) water column pressure difference between the volume of air flow through the material. 在真空体系上设置有孔隙来限制通过样品的空气流为可测量的量。 The vacuum system is provided with apertures to restrict the flow of air through sample to a measurable amount. 孔隙的尺寸取决于材料的孔隙率。 The size of the pores depends on the porosity of the material. Frazier渗透率用设置有校准孔隙的Sherman W. Frazier Co.双压力计（dual manometer) 以ft3/min/ft2单位测量，并转化成m3/min/m2单位。 Frazier permeability is provided with a calibrated aperture bis manometer Sherman W. Frazier Co. (dual manometer) in ft3 / min / ft2 measurement unit, and converted into m3 / min / m2 units. 纳米纤维层由密度为I. 14g/cc (由EI du Pont de Nemours and Company， Wilmington, Delaware可得）的尼龙一6, 6聚合物在纯度为99%的甲酸（由KemiraOyj， Helsinki，Finland可得）中的24重量％溶液电喷制得。  The nanofiber layer having a density of I. 14g / cc (by the EI du Pont de Nemours and Company, Wilmington, Delaware available) nylon-6, 6 polymer at a purity of 99% formic acid (manufactured by KemiraOyj, Helsinki , Finland available) in 24 wt% solution of EFI system. 进料聚合物和溶剂到溶液混合罐，溶液被转移到储存罐，且通过齿轮泵计量加入具有纺丝喷嘴的电喷纺丝包，如PCT专利公开W003/080905中所公开的。 The feed solution to the polymer and solvent mix tank, the solution was transferred to a storage tank, and a solution of electro-blown spinning package with a spinning nozzle by a metering gear pump, as described in PCT Patent Publication W003 / 080905 disclosed. 纺丝包0.75米宽，有76个纺丝喷嘴。 Spinning pack 0.75 meters wide, 76 spinning nozzle. 该纺丝包处于室温， 纺丝喷嘴内的溶液压力为l〇bar。 The spinning pack at room temperature, a solution of the pressure in the spinning nozzle l〇bar. 纺丝头是电绝缘的，且被施加75kV的电压。 Spinneret is electrically insulated, and voltage is applied to 75kV. 通过空气喷嘴以7. 5m3/分钟的速率和660mm H2O的压力将温度为44°C的压缩空气注入到该纺丝包中。 Rate of pressure through the air nozzle 7. 5m3 / min and 660mm H2O The temperature is 44 ° C compressed air is injected into the spinning pack. 从纺丝喷嘴出来的溶液进入处于大气压、65 - 70%的相对湿度和29°C的空气中。 Out of the nozzle into the spinning solution at atmospheric pressure, 65 - air 70% relative humidity and 29 ° C in. 纳米纤维形成方法的聚合物溶液处理量约为2cm3/min/孔。 The method of processing the polymer solution about the nanofiber was 2cm3 / min / hole. 形成的纤维在纺丝包出口下方310mm处平铺在以5 - 12m/分钟运动的多孔带上面的多孔纱布上。 Fibers formed in the spinning package below the outlet plated in 310mm 5 - porous gauze porous 12m / min with the above motion. 在多孔带下面产生100 - 170mm H2O真空的真空室辅助纤维的平铺。 Underneath the belt 100 is generated in the porous - 170mm H2O plated vacuum chamber which secondary fibers. 用作纱布的是来自Kolon Company (S. Korea)的40g/m2 单位重量纺粘PET非织造材料（Finon C 3040)。 As gauze is 40g / m2 basis weight spunbonded nonwoven PET (Finon C 3040) from Kolon Company (S. Korea) a. 纱布的纵向刚度为35g，横向刚度为55g。 The longitudinal stiffness of the gauze is 35g, the transverse stiffness of 55g. 生产出的SN结构用TSI测试器3160测量不同颗粒尺寸的过滤效率和压降，结果在表1中给出。  to produce the SN 3160 Structure of different particle sizes measured filtration efficiency and pressure drop with TSI tester, the results are given in Table 1. 按照实施例1所述制成SN结构，但纳米纤维层具有更高的单位重量。  SN structure prepared according to Example 1 of the embodiment, the nanofiber layer has a higher basis weight. 制得的结构测量各种颗粒尺寸的过滤效率和压降，结果在表1中给出。 The resulting structure of various particle sizes measured filtration efficiency and pressure drop results are given in Table 1. 具有SN结构的过滤介质按实施例1形成：沉积单位重量为约3g/m2的含溶剂的尼龙纳米纤维层于具有约70g/m 2单位重量的FinonC3070纺粘PET纱布上。  The filter media having SN structure formed in Example 1: Deposition basis weight of the nylon solvent-containing nanofiber layer of about 3g / m2 having a spunbonded PET gauze on FinonC3070 about 70g / m 2 in basis weight. 纳米纤维的平均直径约为400nm。 The average diameter of the nanofibers was about 400nm. 在收集器真空压力60mm H2O下将纳米纤维网幅收集在纱布上，以形成复合SN织物，然后复合织物在IKTC和真空压力20mm H2O通过干燥机。 Collector vacuum pressure at 60mm H2O nanofiber web was collected on a gauze, SN fabric to form a composite, the composite fabric then IKTC 20mm H2O and the vacuum pressure through the dryer. 将复合织物打褶以形成褶状过滤介质。 The composite fabric pleated to form pleated filter media. 溶剂粘合方法产生纳米纤维网幅与纱布良好的粘结而不脱层，以及纳米纤维层的对手摩擦褶状介质的良好耐磨性。 Solvent bonding method of producing the nanofiber web good abrasion resistance and good adhesion without delamination gauze, and the opponent friction nanofiber layer pleated media. 打褶前后过滤介质的压降和效率在表2中给出。 Pressure drop and efficiency of the front and rear pleated filter media are given in Table 2. 按照实施例3形成过滤介质，但纳米纤维层在80mm H2O的收集器真空压力下收集于纱布上。  Example 3 is formed in accordance with the filter medium, the nanofiber layer under vacuum pressure of 80mm H2O collector is collected on the gauze. 复合织物打褶成褶状过滤介质。 The composite fabric of pleated filter medium into a pleated. 溶剂粘合方法产生纳米纤维网幅与纱布好的粘结而不脱层，以及纳米纤维层对手摩擦褶状介质的良好耐磨性。 Solvent bonding method of producing the nanofiber web good abrasion resistance and good bonding without delamination gauze, and the nanofiber layer opponents friction pleated media. 打褶前后过滤介质的压降和效率在表2中给出。 Pressure drop and efficiency of the front and rear pleated filter media are given in Table 2. 按照实施例3形成过滤介质，但纳米纤维层在40mm H2O的收集器真空压力下收集于纱布上。  Example 3 is formed in accordance with the filter medium, the nanofiber layer under vacuum pressure of 40mm H2O collector is collected on the gauze. 复合织物打褶成褶状过滤介质。 The composite fabric of pleated filter medium into a pleated. 溶剂粘合方法产生纳米纤维网幅与纱布好的粘结而不脱层，但纳米纤维层易被手摩擦褶状介质磨耗。 Solvent bonding method of producing a nanofiber web with gauze good bond without delamination, but the nanofiber layer easily hand friction wear pleated media. 打褶前后过滤介质的压降和效率在表2中给出。 Pressure drop and efficiency of the front and rear pleated filter media are given in Table 2. 按照实施例3形成过滤介质，但纳米纤维层收集于纺粘PP纱布上。  Example 3 is formed in accordance with the filter medium, the nanofiber layer collected on a spunbond PP gauze. 不存在粘结。 Bond does not exist. 过滤介质通过沉积含溶剂的、单位重量约为3g/m2的尼龙纳米纤维层于来自Kolon 公司的Finon C 3070纺粘PET纱布上形成。  The filter media by depositing a solvent-containing, basis weight of about 3g / m2 nylon nanofiber layer formed on Finon C from Kolon PET spunbond 3070's gauze. 在4mm H2O真空压力收集纳米纤维层于纱布上，并施加两层式梳理织物（HDK Industries, Inc.，格林维尔，南卡罗来纳州）的顶层纱布。 In the top gauze 4mm H2O of vacuum pressure on the collected nanofiber layer of gauze, and applied to two-layered carded fabric (HDK Industries, Inc., Greenville, South Carolina). 梳理织物具有一层梳理尼龙纤维和一层梳理PET纤维。 Carded web having a layer of carded nylon and a layer of carded fibers PET fibers. 引导梳理尼龙纤维层与尼龙纳米纤维层接触以形成复合SNS织物。 Guide carded nylon fiber layer is in contact with the nylon nanofiber layer to form a composite fabric SNS. 复合SNS织物经过凝固辊隙以使纳米纤维层与顶层和底层纱布层溶剂粘合。 SNS composite fabric through a nip to cause coagulation nanofiber layer and the top and bottom layers of gauze solvent bonding. 随后，溶剂粘合的复合物在90°C、20mm H2O真空压力经过干燥机。 Subsequently, the solvent in the adhesive composite 90 ° C, 20mm H2O pressure through the vacuum dryer. 复合织物打褶成褶状过滤介质。 The composite fabric of pleated filter medium into a pleated. 溶剂粘合方法产生纳米纤维网幅与纱布好的粘结而在操作时不脱层，通过一起摩擦褶状介质的两层只有轻微的脱层。 Solvent bonding method of producing a nanofiber web with gauze and good bond delamination during operation, by rubbing together two layers of pleated media only slight delamination. 打褶前后过滤介质的压降和效率在表2中给出。 Pressure drop and efficiency of the front and rear pleated filter media are given in Table 2. 按照实施例5所述形成过滤介质，但纳米纤维层的单位重量为5g/m2。  The filter medium formed as described in Example 5, but the basis weight of the nanofiber layer was 5g / m2. 复合织物打褶成褶状过滤介质。 The composite fabric of pleated filter medium into a pleated. 溶剂粘合方法产生纳米纤维网幅与纱布好的粘结而在操作时不脱层， 一起摩擦褶状介质的两层没有脱层。 Solvent bonding method of producing a nanofiber web with good adhesion and no delamination gauze in operation, friction pleated media layers together without delamination. 打褶前后过滤介质的压降和效率在表2中给出。 Pressure drop and efficiency of the front and rear pleated filter media are given in Table 2. 按照实施例5所述形成过滤介质，但底层纱布是Finon F 5070纺粘PET纱布且收集器真空压力为5mm H20。  The filter media is formed as described in Example 5, but the underlying gauze Finon F 5070 are spunbond PET collector gauze and vacuum pressure was 5mm H20. 复合织物打褶成褶状过滤介质。 The composite fabric of pleated filter medium into a pleated. 溶剂粘合方法产生纳米纤维网幅与纱布好的粘结而在操作时不脱层，通过一起摩擦褶状介质的两层只有轻微的脱层。 Solvent bonding method of producing a nanofiber web with gauze and good bond delamination during operation, by rubbing together two layers of pleated media only slight delamination. 打褶前后过滤介质的压降和效率在表2中给出。 Pressure drop and efficiency of the front and rear pleated filter media are given in Table 2. 按照实施例7所述形成过滤介质，但收集器真空压力为IOmm H20。  as described in Example 7 to form a filter medium, the pressure of the vacuum collector IOmm H20. 复合织物打褶成褶状过滤介质。 The composite fabric of pleated filter medium into a pleated. 溶剂粘合方法产生纳米纤维网幅与纱布好的粘结而在操作时不脱层，一起摩擦褶状介质的两层没有脱层。 Solvent bonding method of producing a nanofiber web with good adhesion and no delamination gauze in operation, friction pleated media layers together without delamination. 打褶前后过滤介质的压降和效率在表2中给出。 Pressure drop and efficiency of the front and rear pleated filter media are given in Table 2. 按照实施例7所述形成过滤介质，但收集器真空压力为20mm H20。  The filter media formed according to Example 7, but a collection of vacuum pressure 20mm H20. 复合织物打褶成褶状过滤介质。 The composite fabric of pleated filter medium into a pleated. 溶剂粘合方法产生纳米纤维网幅与纱布好的粘结而在操作时不脱层，通过一起摩擦褶状介质的两层只有轻微的脱层。 Solvent bonding method of producing a nanofiber web with gauze and good bond delamination during operation, by rubbing together two layers of pleated media only slight delamination. 打褶前后过滤介质的压降和效率在表2中给出。 Pressure drop and efficiency of the front and rear pleated filter media are given in Table 2. 根据本发明通过沉积3g/m2的聚酰胺纳米纤维层于30g/m2的纺粘PET基底纱布(Finon C 3040)上形成过滤介质，预成形的70g/m2纺粘PET顶层纱布（Finon C 3040)经过粘合剂层压到纳米纤维层以形成SNS结构。  According to the present invention is formed by depositing a polyamide nanofiber layer 3g / m2 spunbond PET substrate in gauze 30g / m2 of (Finon C 3040) on the filter medium, 70g / m2 spunbond PET preformed top layer of gauze (Finon C 3040) laminated through an adhesive layer to form a nanofiber structure SNS. 打褶前后过滤介质的压降和效率在表2中给出。 Pressure drop and efficiency of the front and rear pleated filter media are given in Table 2. 根据本发明的在线溶剂粘合方法，通过沉积3g/m2的聚酰胺纳米纤维层于70g/m 2 的纺粘PET基底纱布（Finon C 3040)上形成过滤介质，并沉积30g/m2的纺粘PET顶层纱布(Finon C 3040)于纳米纤维层上，以形成SNS结构。  The in-line solvent bonding method of the present invention, the filter medium is formed on a spunbond PET substrate gauze (Finon C 3040) 70g / m 2 by the polyamide nanofiber layer deposited 3g / m2, and the deposition of 30g / m2 PET spunbond top gauze (Finon C 3040) on the nanofiber layer to form an SNS structure. 打褶前后过滤介质的压降和效率在表2中给出。 Pressure drop and efficiency of the front and rear pleated filter media are given in Table 2. 如上所述，在仅仅40mm H2O真空下沉积的对比例A的抗磨性不够，这和本发明的实施例3和4不同，后者显示出良好至好的耐磨性。  As described above, deposited in a vacuum to 40mm H2O only abrasion resistance of Comparative Example A is not enough, this embodiment of the present invention and the embodiments 3 and 4 different from the latter to exhibit good good abrasion resistance. 使用高度非极性PP纺粘纱布的对比例B 不能获得用作过滤介质的纱布和纳米纤维层的足够粘结。 Using highly non-polar PP spunbond gauze sufficient adhesion can not be obtained as Comparative Example B gauze filter media and nanofiber layer. 与根据本发明在线溶剂粘合层压方法形成的、同样SNS结构的实施例10相比，粘合剂层压的对比例C显示出降低的效率和升高的压降。  Compared with Example 10, the same SNS structure formed in accordance with the present invention, solvent bonding line lamination process, adhesive lamination of Comparative Example C showed increased efficiency and reduced pressure drop. 1. 复合织物，包含溶剂粘合到第一支撑网幅上的电喷聚合物纳米纤维网幅，所述第一支撑网幅包含比所述纳米纤维平均直径大并由与所述纳米纤维相容的材料纺丝形成的纤维，在所述网幅之间没有粘合剂。 1. The composite fabric containing the solvent bonded to the polymer nanofibers EFI web on a first supporting web, said web comprising a first support than the average diameter of the nanofibers of the nanofiber by large phase spun fibrous material formed of tolerance, no web between the pressure-sensitive adhesive. 2. 权利要求1的复合织物，其中纳米纤维聚合物选自聚酰胺、聚酯、聚氨酯、聚偏二氟乙烯和聚乙烯醇，所述支撑网幅包含选自聚酰胺、聚酯、聚氨酯、聚偏二氟乙烯、聚乙烯醇、 天然纤维和其组合的纤维。 2. The composite fabric as claimed in claim 1, wherein the nanofiber polymer is selected from polyamides, polyesters, polyurethanes, polyvinylidene fluoride and polyvinyl alcohol, said support web comprising selected polyamides, polyesters, polyurethanes, polyvinylidene fluoride, polyvinyl alcohol, natural fibers and combinations thereof. 3. 权利要求2的复合织物，其中纳米纤维和支撑网幅纤维均为聚酰胺。 The composite fabric of claim 2, wherein the nanofiber web and the support are polyamide fibers. 4. 权利要求1的复合织物，其中支撑网幅为非织造网幅，选自纺粘纤维、熔喷纤维、梳理纤维、湿法成网纤维和其组合。 The composite fabric of claim 1, wherein the support web is a nonwoven web selected from a spunbond fibers, meltblown fibers, carded, wet-laid fibers, and combinations thereof. 5. 权利要求1的复合织物，其中纳米纤维网幅包含具有约200nm - 500nm平均纤维直径、至少2. 5g/m2的单位重量的聚酰胺纳米纤维，且支撑网幅包含梳理聚酰胺纤维和梳理聚酯纤维的双层结构，其中纳米纤维网幅与梳理聚酰胺纤维层溶剂粘合。 The composite fabric of claim 1, wherein the nanofiber web comprises a from about 200nm - 500nm average fiber diameter, the basis weight of the polyamide nanofiber of at least 2. 5g / m2, and the web support comprises a polyamide carded fibers and carded polyester fiber-layer structure, wherein the nanofiber web layer of polyamide fibers and carded solvent bonding. 6. 权利要求1的复合织物，进一步包含第二支撑网幅，其包含比纳米纤维平均直径更大且由与所述纳米纤维相容的材料纺丝形成的纤维，所述第二支撑网幅溶剂粘合到所述纳米纤维网幅上，与第一支撑网幅相对。 1 the second composite fabric web support according to claim 1, further comprising a second support web, which comprises an average fiber diameter larger than the nano-fibers and are formed from compatible with the spun nanofiber material, the solvent bonded to the nanofiber web, opposite to the first support web. 7. 形成复合织物的方法，包含将聚合物纳米纤维网幅和针对其的溶剂电喷到移动的包含更大纤维的支撑网幅上，该更大纤维由与所述纳米纤维聚合物相容的材料纺丝形成；和， 对所述结合的网幅施加约4mm H20 - 170mm H20的真空压力以将所述纳米纤维网幅和所述支撑网幅溶剂粘合。 7. A method of forming a composite fabric, comprising the polymer nanofiber web and the support web to comprise a larger movement of the fibers for EFI solvent thereof, the greater the fiber is compatible with the polymer nanofiber forming spun material; and, applying about 4mm H20 of the combined web - 170mm H20 vacuum pressure to the nanofiber web and the support web solvent bonding. 8. 权利要求7的方法，其中施加的真空压力在约60mm H20 - 170mm H20,以形成溶剂粘合的纳米纤维网幅/支撑网幅复合织物。 The method of claim 7, wherein the vacuum pressure applied at about 60mm H20 - 170mm H20, solvent bonding to form a nanofiber web / support composite fabric web. 9. 权利要求7的方法，其中施加的真空压力在约4mm H20 - 30mm H20之间，且进一步包括沉积第二支撑网幅于所述纳米纤维网幅上以形成支撑网幅/纳米纤维网幅/支撑网幅式复合织物，该第二支撑网幅包含由与所述纳米纤维聚合物相容的材料纺丝形成的更大的纤维，并使所述复合织物经过凝固辊隙以使所述复合物溶剂粘合。 9. The method of claim 7, wherein the applied vacuum pressure of about 4mm H20 - between 30mm H20, and further comprising a second support web is deposited on the nanofiber web to form a support web / nanofiber web / support composite fabric web, the second web support comprises fibers formed from more compatible with the polymer material spun nano fiber, and solidifying the composite fabric through the nip such that composite solvent bonding. 10. 权利要求9的方法，进一步包括在真空下干燥溶剂粘合的复合织物以去除溶剂。 10. The method of claim 9, further comprising an adhesive composite fabric was dried under vacuum to remove the solvent to the solvent. MX2009001101A (en) * 2006-07-31 2009-02-10 Du Pont Polyarenazole microfilaments and process for making same. NL2002036C (en) * 2008-09-29 2010-03-30 Filo Engineering Method and system for the production of textile material. MX359078B (en) 2012-01-05 2018-09-13 Bha Altair Llc Waterproof and salt repellant media and filter. JP4379797B2 (en) 2004-05-12 2009-12-09 株式会社小糸製作所 Welding method and welding apparatus of the shroud glass tube in a discharge lamp arc tube.